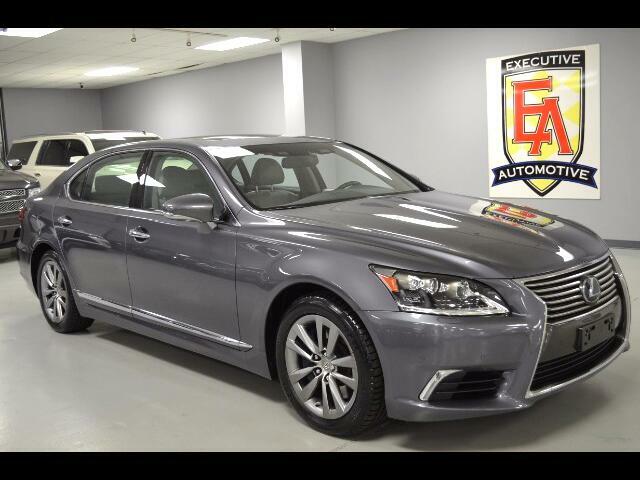 2015 Lexus LS 460L AWD, Gray with Gray Leather, 28k Miles. Original MSRP $101,329. 4 NEW MICHELIN TIRES!! Options Include the Ultra Luxury Package: Heated and Cooled Rear Outboard Climate Controlled Seats, Rear Audio Controls, Power Rear Outboard Seats, 4 Zone Climate Control System, Rear Seat Side Airbags, Lumbar Massage and Butterfly Headrest, Heated and Cooled Front Climate Controlled Seats, Power Rear Door Sunshades, Rear Air Conditioning with Cool Box, Rear Overhead Ducts and Air Purifier, ADAPTIVE VARIABLE AIR SUSPENSION WITH VARIABLE GEAR RATIO STEERING, ADVANCED PRE-COLLISION SYSTEM WITH ALL SPEED DYNAMIC RADAR CRUISE CONTROL, ACTIVE PEDESTRIAN DETECTION SYSTEM WITH INFRARED CAMERAS, DRIVER ATTENTION MONITOR, LANE KEEP ASSIST AND LOW SPEED AVOIDANCE SYSTEM, LED HEADLAMPS WITH INTELIGENT HIGHBEAMS AND WASHERS, MARK LEVINSON 19 SPEAKERS WITH DVD/CD PLAYER, SEMI ANILINE LEATHER TRIM INTERIOR AND ALCANTARA HEADLINER UPGRADE, NAVIGATION SYSTEM, BACK-UP CAMERA, BLIND-SPOT MONITOR, BRAKE ASSIST SYSTEM, CROSS TRAFFIC ALERT SYSTEM, ADAPTIVE CRUISE CONTROL, POWER TILT/SLIDING MOON-ROOF, AUTO-LEVELING HEADLIGHTS, BLUETOOTH CONNECTION, HEATED STEERING WHEEL, KEYLESS ENTRY, PUSH BUTTON START, RAIN SENSING WIPERS, STEERING WHEEL AUDIO CONTROLS, TURN SIGNAL MIRRORS, UNIVERSAL GARAGE DOOR OPENER, FOG LIGHTS, HD RADIO, DRIVER/PASSENGER ADJUSTABLE LUMBAR, ELECTROCHROMIC REAR-VIEW MIRROR, POWER WINDOWS, POWER LOCKS, POWER MIRRORS, POWER FOLDING MIRRORS, POWER SEATS (both), Contact Kyle Porter at 816-616-2500 or email: kyle@executiveautomotive.com for additional information. Thanks for your interest in our LS 460L!